Dental implants are artificial tooth roots that are surgically placed beneath the gum line, allowing doctors to mount a replacement tooth. They come in the form of titanium screws that are placed in and on the jawbone, mimicking natural tooth roots. 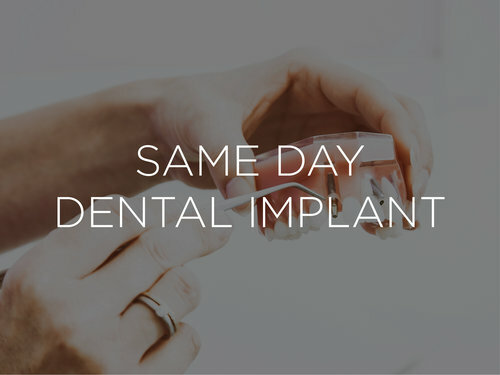 Same day dental implants are a cutting-edge solution to the lengthy healing time and painful side effects of normal teeth replacement procedures. With computer assistance and precise calculations, we can send you home with a complete set of dental implants in a day. 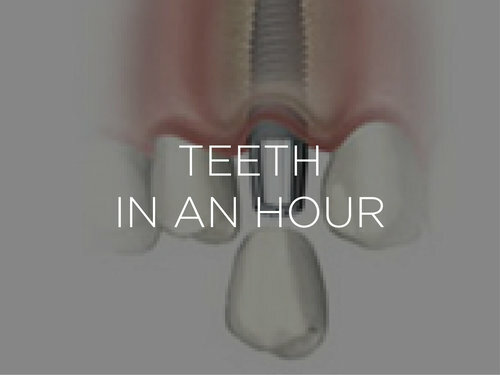 Teeth in an Hour ™ will give you complete dental implants or teeth replacements in about an hour. Typically those in need of teeth replacement would have multiple, often painful surgeries over many months to get what can now be done in a fraction of that time. All on 4 Implants will give you complete dental implants or teeth replacements in as little as one hour. Typically those in need of teeth replacement would have multiple, often painful surgeries over many months to get what can now be done in a fraction of that time. Dental implants are artificial tooth roots that are surgically placed beneath the gum line, allowing doctors to mount a replacement tooth. They come in the form of titanium screws that are placed in and on the jawbone, mimicking natural tooth roots. Dental implants are the best solution for anyone missing teeth as a result of injury, gum disease, or other dental health problem. This is because they are unlikely to become lose the way dentures do, and they don’t need support from other teeth as bridges do. This makes dental implants a very attractive tooth replacement that mimics natural teeth in every way. So if you’re looking for a dental restoration option that will restore your smile, choose dental implants. You don’t want to end up with the wrong dental implant. So before you schedule an appointment for dental replacements, ensure your doctor is certified to conduct the procedure you have in mind. With that said, here are the two different types of dental implants. Endosteal Implants: the most common type of dental implants in New York City and around the world. They mimic the shape of a small screw, cylinder, or blade and are surgically placed into the jawbone. This type of implant requires a two-stage surgery. In the first stage, the implant is embedded into the jawbone, and several weeks pass while the bone accepts the implant and bonds with it. During the second stage of the surgery, the head of the implant is exposed and abutment and restoration tooth attached. Subperiosteal Implants: Unlike endosteal implants, where the titanium plates are placed into the jawbone, subperiosteal implants are placed on the jawbone. This type of dental implant leaves the implant head exposed so that the restoration tooth can be mounted in the same procedure. Subperiosteal implants are more common in patients with a shallow jawbone who may not be in a position to undergo a second procedure. Dental implants may vary in size and height. 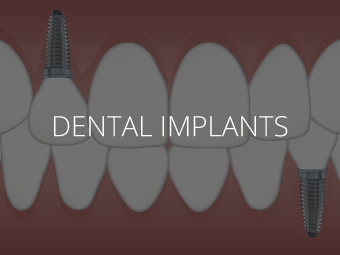 A dentist qualified to conduct a dental implant should advise you on the type of implant that is ideal for you. Same Day Dental Implant: All you have to do is check-in at our offices for dental implants and check-out with a set of new implants. The procedure uses the latest technology and eliminates the need for sutures common to normal dental implant procedures. As a result, the healing time that would have taken up to 4 months or more is shortened to a span of hours. You can enjoy a nice meal a few hours after getting dental implants at our offices! 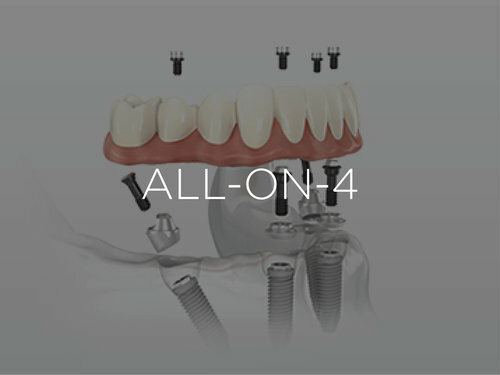 All-ON-4: Need a full arch implant prosthesis to replace all your teeth? Want the procedure done in a short time? Look no further. With our All-ON-4 dental implant service, you get your new teeth in as little as one hour. The procedure uses the latest dental implant technology to surgically attach 4 implants, through which the prosthesis is fixed. To enjoy this quick dental implant experience, make sure all extractions and bone grafting is done prior. All-ON-4 is notable for minimal pain, stability in minimum bone volume, prosthetic flexibility, and a much shorter treatment time. Teeth In An Hour: As the name suggests, this service will provide you with a new set of teeth in about an hour’s time. You no longer have to wait months to get your dental implants or suffer through a slow healing process. In fact, our procedure is virtually painless and should allow you to get back to normal eating the very same day.